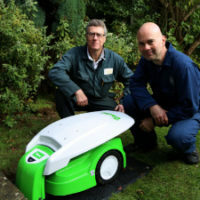 Garden Trader has recently published a case study from Lawrence Gale that documents his experience dealing with The Mower Shop to have a robotic mower installed for his disabled brother-in-law. Our team are exceptionally proud of this case study as it demonstrates the quality of the products we offer and also the service that we provide. Find this case study here. If you’d like to discuss how a robotic mower can benefit you please get in touch with the team at our West Haddon showroom or on 01788 510 453.